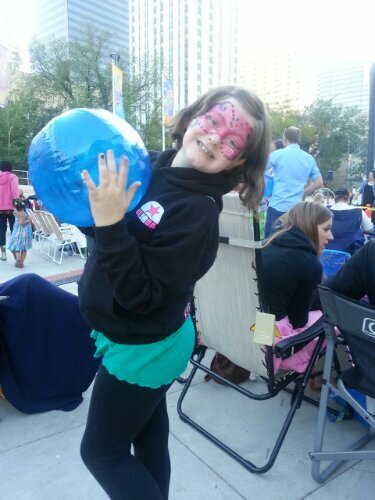 Under the light of the moon-Movies on the Square – Dancing in the rain! 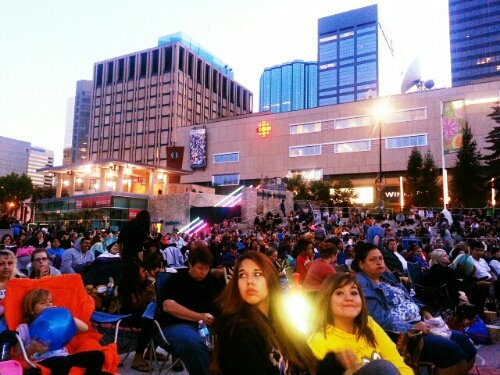 I love Sir Winston Churchill Square in the summer. 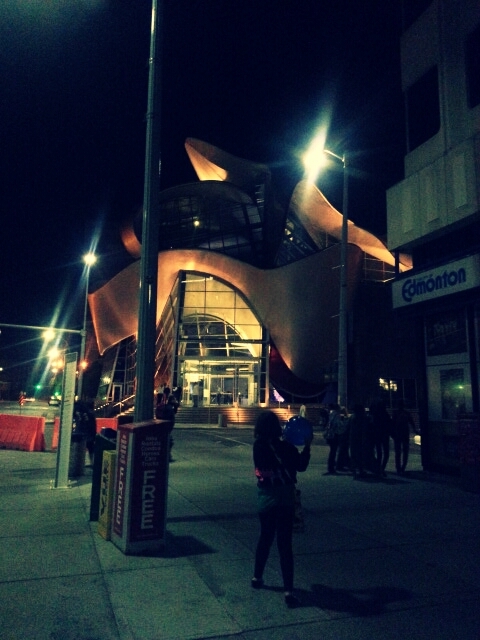 The city organizes all sorts of family events and festivals to bring people to this downtown meeting place. 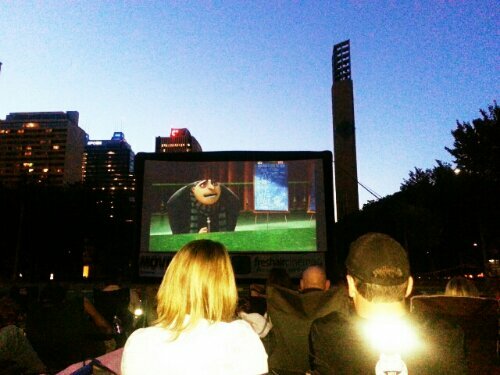 Last night the offering was Movies on the Square, a free screening of Despicable Me on a huge blow up screen. The fun commenced long before dusk fell. A D.J. lit up the popular downtown mecca with the sounds of summer, Polynesian dancers delighted young and old alike, even giving mini dance lessons to those willing to shake their groove thing in front of strangers. Free hoola hoops, beach balls and sunglasses were a hot accompaniment to a summer evening that’s weather could only be described as “close to perfect”. 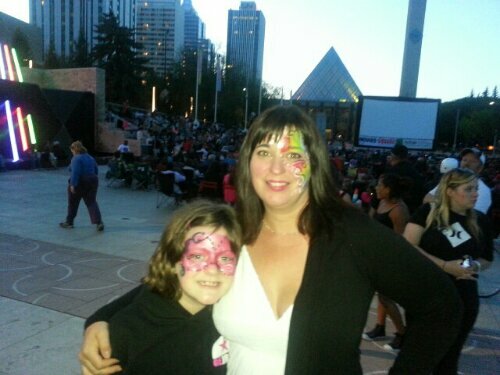 Families delighted in face painting, balloon making, outdoor chess, table tennis, a bouncy house slide and some cooled off in the city hall wading pool. Food trucks offered tasty delights such as pulled pork, hot dogs, pizza, mini donuts and no movie night would be complete without hot, fresh popcorn. In addition to the Amphitheater seating families brought fold up chairs and blankets to ensure a comfy and cozy movie experience under the stars. It was a wonderful night, even long before the movie started my teenager told me how much fun she and her friends were having and the youngest loved the beachy atmosphere. 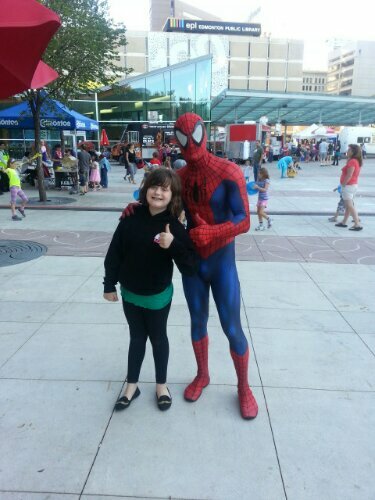 A crowd favorite was Spider Man who talked and posed for pictures with all the children. Lots of prizes were given out, I won glow in the dark bubbles 🙂 The movie commenced around 9:45 when nature struggled to dim the lights on a magnificant summer day. My son would have gone crazy if he saw spiderman! I wish we had activities like that in our city! The wee kids were going crazy over Spidey and he was great with them. I do like that we have such great activities. I remember movies in the park as a kid. In fact they still show them in the Inland area. The Hollywood cemetery every Saturday from April through September shows movies at dusk using the side of the Great Mausoleum as a screen. Short folding chairs, food, alcohol and interaction is encouraged. I’ll have to go before the season ends. Didn’t mean to rattle on, just where you saw your movie reminded me of what hollywood does. Big and open, looks like a lot of fun you guys had!!! Lawn chairs, picnic food and vino under the stars in a cemetery after dark, sounds like fun! !